A holiday item that was once believed to have been lost forever has been found and restored. HOULTON, Maine — A holiday item that was once believed to have been lost forever has been found and restored. Cheryl Lovely, owner of Mini Music and Tack Shop on Main Street in Houlton, said Monday that she had all but given up hope of ever seeing the ornate wooden church that once was part of Dunn Furniture Company’s annual holiday window decorations display in downtown Houlton. Since her 73 Main St. business is located in the former Dunn Furniture Company, Lovely has long wondered what had happened to some of the many elaborate decorations that used to grace the storefront windows. But it was the church that she missed the most. First built in in 1954, the wooden church was designed by Clayton “Chick” Currie and constructed by Ronnie Craigs. In 1989, Lovely said she borrowed the church, which had been stored in Dunn Furniture Company’s warehouse on Alice Avenue. At that time, the church was in “pretty rough shape,” according to Lovely. In the mid-90s, Lovely again approached Dunn to see if she could use the church and was told it was believed to have been destroyed when a fire ravaged the Dunn’s warehouse. 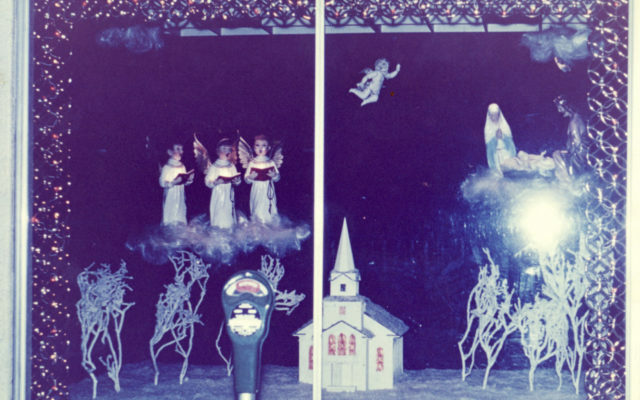 Many of the holiday decorations were destroyed in the fire. When Dunn Furniture Company closed its doors in early September, local businessman Matt Carr purchased the contents of the company’s warehouse, located behind their storefront on U.S. Route 1. Lovely helped Carr unbox some of the items, and her heart skipped a beat when she opened one of the boxes to find the steeple to the church. After a bit more digging in the warehouse, lo and behold, wrapped neatly under a tarp was the remaining piece of the church. 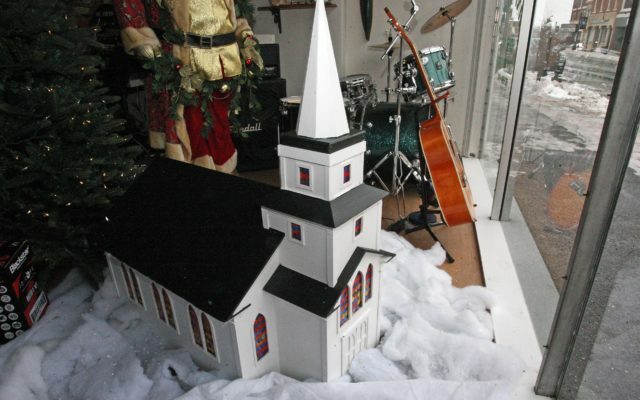 Lovely said Ken Clukey, who does repairs on guitars for her business, refurbished the church for display in her window. Dunn said he was beyond delighted to learn that the church had not only been found, but also restored to its original splendor. Lovely invited Dunn to her business last week to get a look at the newly-restored church, which had meant so much not to just him, but many others.